Well the time has come - tomorrow (Wednesday) we head off up North. The office is particularly quiet as most people are taking the day off to pack and spend with their families. I have spent the morning loading matlab onto an external hard drive and ensuring that the programs I have written to analyse the ADCP data are working correctly and none have been left behind. 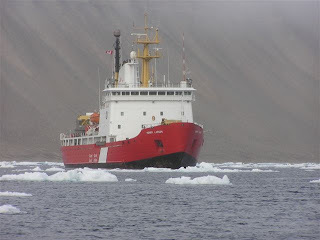 Recovering oceanographic moorings in the Nares Strait, Cardigan Strait and Penny Strait which have been measuring current, ice drift, ice thickness, tide, temperature and salinity since 2007. These will be serviced on board and will be redeployed in a new locations. Taking CTD profiles in Nares Strait, Fram Sound and Penny Strait. When ice gets in the way, a portable CTD will be transported via helicopter and deployed from the ice. Water samples for analysis of salt, dissolved nutrients, oxygen and barium concentrations will also be collected for each profile. Carry out a complete CTD profile along the mouth of the Petermann Fjord using a towed CTD as well as collecting water samples. We will also visit a set of time lapse cameras to retrieve the data. 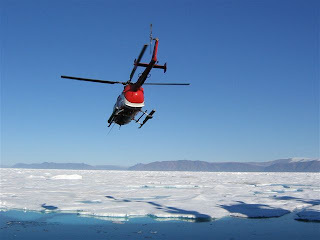 Other scientists not from the IOS will also be studying multi year ice thickness using drill holes and surface-based electromagnetic induction radar as well as a electromagnetic induction (EMI) sensor towed beneath a helicopter. 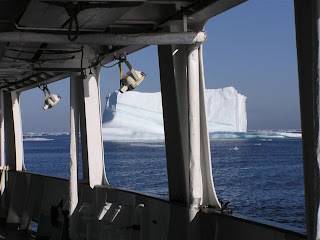 One concern for this years cruise is the ice state in the Nares Strait. Unusually a large ice bridge formed during the winter of 08-09 right at the northern end of the Nares Strait in the Lincoln sea. Surprisingly this remained in place right up till the beginning of July and allowed the Greenpeace Vessel Arctic Sunrise to sail almost to Alert (the most northern permanently inhabited place in the world - see here). 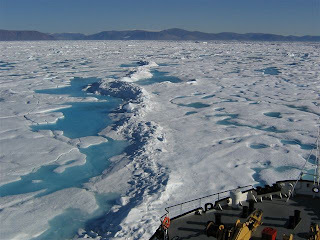 The blog from the guest scientist (from the Byrd Polar Research Centre) can be here. He talks about many of the places we will be visiting. However on July 7th the ice bridge collapsed releasing vast amount of old floes into the strait hence making navigation very difficult as the Henry Larsen cannot break through multi-year ice. Satallitie photos and animations of the break up can be seen here. We disembark the boat on September 1st at Resolute bay and after 5 flights arrive back at the IOS on September 3rd. Below are some photos from the cruise two years ago which are fantastic. I hope to keep this blog updated whilst I am away - so watch this space! PS - a map of the area around the Nares Strait can be found here and resolute bay here. Beautiful pictures! And excellent work on the blog.